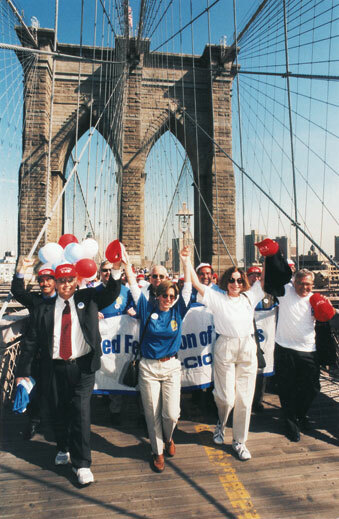 Weingarten (front, center) leads marchers — including then-AFT President Sandra Feldman (next to Weingarten) — across the Brooklyn Bridge for a May 12, 1999, budget rally that drew 50,000 UFTers and other activists to City Hall. As the UFT’s fourth president, serving from 1998 to 2009, Randi Weingarten led the union through a period of economic instability, two contentious city administrations and mounting attacks on the labor movement and public education. She relished working at the vortex of public education and the labor movement, which she considered the two most powerful engines for social and economic justice. By the time Weingarten left the UFT to lead the AFT last year, she had negotiated an unprecedented 43 percent salary increase over six years for UFT-represented educators and brought 28,000 new members into the UFT ranks by organizing home-based family child care providers. She was instrumental in winning several landmark lawsuits, including the Campaign for Fiscal Equity court case forcing the state to bolster its spending on city schools and another ordering the city to clean up long neglected, unsafe and crumbling schools. Years of struggle followed to ensure that schools got the funding and repairs that the courts had ordered. Weingarten’s mission was fostering “schools where parents want to send their children and educators want to work,” as she so often said. Her focus never wavered from professional excellence, student achievement and smaller classes. Weingarten fought for excellence by fighting for competitive salaries ­— city teachers were earning 25 percent less than their suburban colleagues when she became president in 1998. In 2001, 17 percent of city teachers were uncertified, 24 percent left after their first year, 14,000 were planning to retire and a massive shortage loomed. By 2009, salaries had broken the $100,000 ceiling and retirement was possible at age 55 with 25 years’ experience. Today the city is an attractive market for the best and the brightest in teaching. Known as a shrewd strategist and negotiator, Weingarten took the lead in education reform with an uncanny ability to craft policy innovations that addressed the needs of UFT members, management and the students. When a Department of Education push for individual merit pay based on improved test scores threatened to divide schools, for example, she turned it into a voluntary schoolwide bonus, a reward for collaboration. Weingarten was tireless in her criticism of the DOE’s ever narrowing focus on a test-driven curriculum and its effects on teacher professionalism and creativity. She pressed for support of struggling schools through the creation of the Chancellor’s District in 1999 that included longer school days, abundant resources and after school, summer and weekend programs. The district gained national fame — and had a successful track record of raising student achievement — before Chancellor Joel Klein dismantled it in 2003. A firm opponent of Mayor Rudolph Giuliani’s push for school vouchers, Weingarten was open to charter schools as incubators of new ideas as long as they did not compromise public school space or funding. The UFT now operates two charter schools and represents 12 charter schools across the city. In 2002, Weingarten spearheaded the relocation of the UFT’s headquarters, the first major real estate deal in Lower Manhattan after Sept. 11, to make a statement to a struggling city and to give members a new home. Weingarten successfully used the media, member activism and community support to rally tens of thousands in the fight to safeguard school budgets and she led health benefits bargaining as chair of the Municipal Labor Committee, the umbrella group for all municipal unions, for 10 years. Throughout her tenure, Weingarten successfully balanced member interests and education reform, always focused on finding the sweet spot in education policy that was good for kids and fair for educators.